Description: "Linus Watkins has been cleaning Ray’s windows for years. So when Linus suffers an accident and is out of action, Ray doesn’t hesitate to help him. With his best friend, Cain, at his side, Ray sets out on Linus’ cleaning round. All too soon, they discover Linus’ accident wasn’t an accident…"
Ray Rosenthorpe and his best buddy Cain are on the hunt after their friend Linus Watkins’ window cleaning business takes a stall due to sabotage. Someone is out to get Linus – But who? Who is in the white van? Why does Linus keep incoherently mentioning a freezer?…And just what is this secret recipe for Linus' magic cleaning bubbles?! Linus’ situation takes a turn for the worse, but with Ray’s back spasms at their wits end and Cain unable to take off much time from work, will the chocolate-loving, tea-sipping duo be able to come together long enough to figure this mystery out? 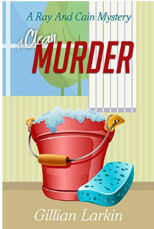 I appreciate the pace the author takes in this cozy mystery. Fast enough to ensure you don’t lose interest but slow enough to ensure the details needed are still there. A clean murder was an easy enough read to follow along and enjoy; however, starting with the first book in the series will probably be the wisest way to go, as I feel it will give us a deeper sense of the characters and their traits. That being said; Not having read the first two, it did not take away from the enjoyment of making this a perfect rainy day read. Download now via: amazon.ca, amazon.com or amazon.co.uk – Enjoy! 4 out of 5 Sponges – This was my first read from Gillian Larkin. Excited to start (hah) the series and move on to even more from this easy going author! 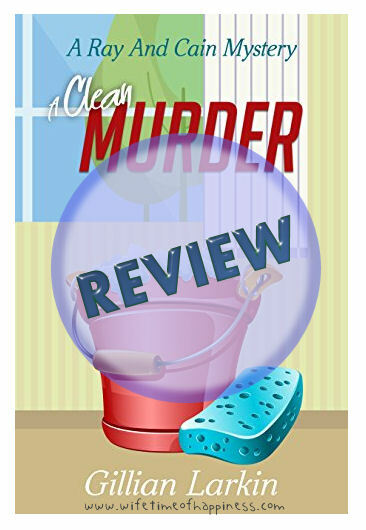 This entry was posted in Book Reviews, Kindle Downloads and tagged A Clean Murder, A Clean Murder Gillian Larkin, book reviewers, cozy mysteries kindle, cozy mystery downloads, cozy mystery reviewers, detective cozy mysteries, Gillian Larkin, Gillian Larkin cozy mysteries, gillian larkin kindle, kindle downloads, PR friendly bloggers, pr friendly book reviewers.